Google Instant is not necessarily the first to do what it does. But it has inspired a clutch of copycat applications from passionate coders. 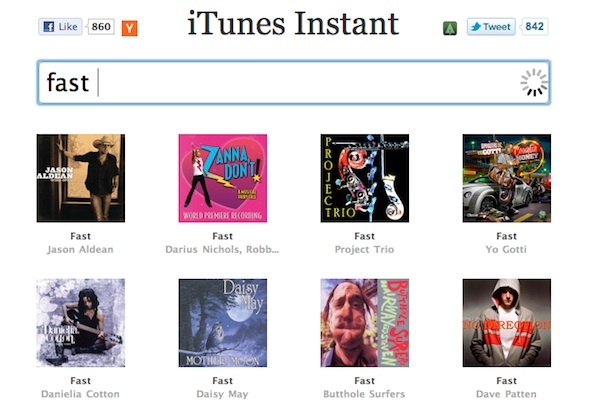 The latest, courtesy of a 15-year-old coder, is iTunes Instant. The young entrepreneur Stehen Ou has used iTunes’ public APIs in much the same way YouTube Instant uses YouTube APIs. Neither are quite as smart as Google’s solution (which uses all sorts of clever ways to work out what you may be about to type, including looking at what other folks have been hunting for), but are impressive nevertheless. As you type words into the iTunes Instant search bar, the code shuffles through the iTunes Store, works out which music files may be relevant to your query, and displays them complete with album art. It took Stephen just three hours to throw together, and you can color us impressed: It’s neat, efficient and a surprisingly useful music discover tool (in the same way Google’s tool is designed to tempt you to click on links you may never have seen or clicked on using a non-Instant search). That leaves us with two questions: Will Apple spend some of that multi-billion dollar cash fund and hire the wunderkind Ou as a tech consultant, just as YouTube hired the YouTube Instant developer? That would be a neat PR move. And secondly, what will be the next online service to get the Instant treatment? Will we see super-fast ways to discover books in Amazon, dig up useful stuff on eBay, or discover brand new por — er, adult entertainment shows?